Chris wanted to take a photo while on an airplane flight. The aircraft type was a Q400. He didn't have a camera with him, only his Apple iPhone 3GS. The scanning order of the phone sensor combined with the refraction from the window caused the "detaching blades" phenomenon seen. 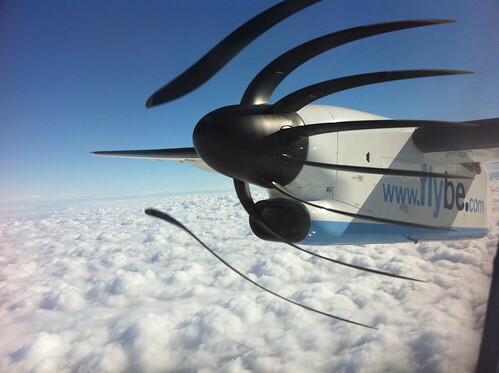 Rotating the camera warped the blades in different directions. The footage was brought into After Effects and rotated to match the physical rotation of the iPhone. Coincidentally, there have been some recent issues associated with the Bombardier Dash Q400 Aeroplane as reported by The Wall Street Journal (August 2010), involving an inquiry by Canadian air safety regulators. Some of the negative sentiment associated with the Bombardier Q400 was depicted in the little drawing above, involving an earlier issue with the same model of aircraft. Faulty landing gear was one of the worst problems. 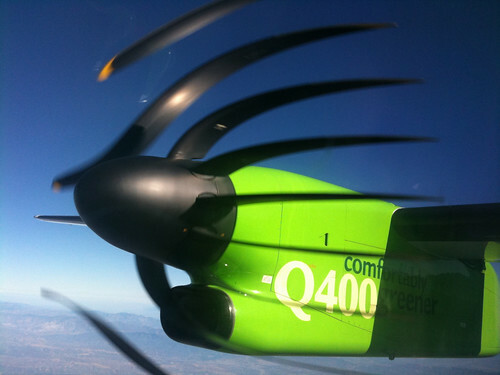 Despite the appearance of Chris's photo, there have never been any problems with Q400 propellers, e.g. falling off in mid-flight. Wanted to try this - flying to Guernsey [UK] and back today. It's an iPhone 4, and the scanning typically goes from top left to bottom right so moving objects lean to the left. Essentially any electronic shutter camera (i.e. not an SLR-like mechanical shutter) will give these effects. Wikipedia has some good articles. For those who want to try this out, just point your simple electronic shutter camera at an object moving parallel to you, preferably fast, and take the photo. The faster the relative speed between you, the more the distortion. Rotating objects go really weird!" Observed on other types of aircraft too! I noticed that the official Despicable Me blimp (yes, from that animated motion picture with the minions) displays the same effect. Here are two photos of the blimp where it is evident. The effect is a little bit more centered in this image of Despicablimp.